It had been a stressful, emotional, and exhausting few weeks. And this night, Christmas Eve, had been more of the same. Mikey’s autism had been in full-blown mode, with the added challenges of severe gastric problems that were impacting all of our lives. It had taken all of our strength and patience to get Mikey to bed tonight. And, finally, he was asleep. My wife and I spent some time downstairs watching TV. But shortly after Mikey was sleeping, my wife decided she needed to go to bed, too. I was too wound up and indicated that I was going to stay on the couch a little longer and watch some more TV. I channel-surfed for a bit and searched for a good, old movie to distract me. It wasn’t long before the remote control fell to the floor and I was fast asleep on the couch. Suddenly, my dreams were filled with an odd, disturbing sound that sounded like hands rapidly clapping. I then realized I wasn’t dreaming as a shimmering, glowing light enveloped my eyelids and forced me to open them and squint at the horror in front of me. 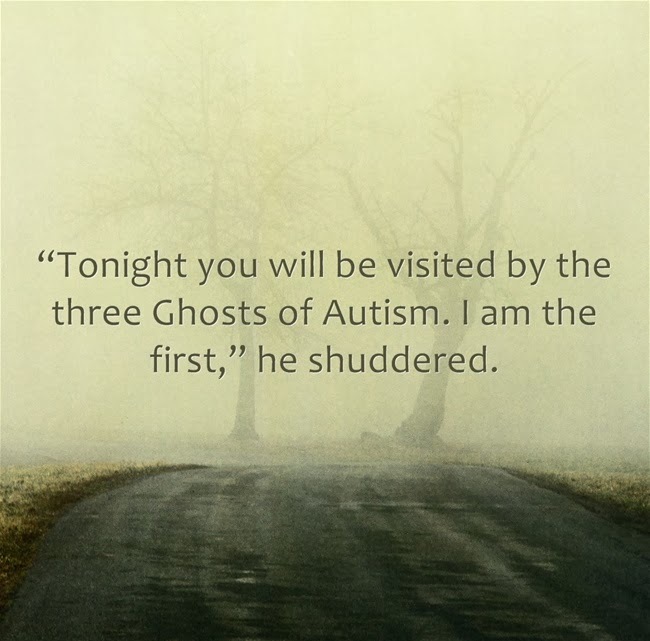 “I am the Ghost of Autism Past,” he bellowed as he shuddered from the effort of speaking. “Leave me alone! I just want to go to sleep! I’ve been haunted by autism enough on this night,” I pleaded. “Come with me! Things were not always as they are now,” the haunting spirit said as he pulled me along with him. “What is this place? Why do you torture me like this?” I begged. “You do not know torture. The children of this place, they knew torture,” he admonished. I soon realized by the clothing of the doctors, nurses, and others that, whatever this place was, we were in the late 1960s or ‘70s. It brought me back to my own childhood, but not one that was anything like this. “Your thoughts are correct, Daniel. This is an autism treatment center in 1969,” the ghost confirmed. “Cures of evil? What do you mean? What is going on here?” I shouted. I next opened my eyes to find myself in a pool of sweat and still trembling with utter sadness. Was I losing my mind, was the stress finally getting to me? I made my way upstairs to go to bed, pausing along the way to peek in on Mikey. He looked content. I sighed, got into bed, and let my head hit the pillow. Just as I thought my nightmares were behind me, a new light glowed before my eyes and I heard a different unsettling sound. It was one word being repeated over and over and over. Yet, I couldn’t understand it. 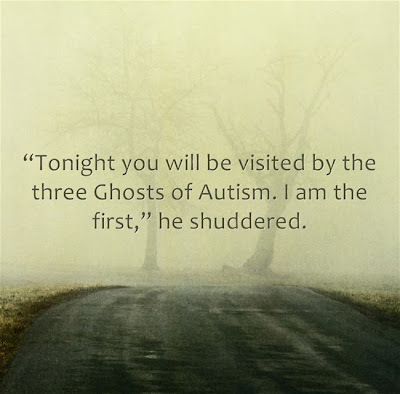 “I am the Ghost of Autism Present,” he screeched. “Of course you are,” I moaned and wondered where I would be brought next. The ghost said no more and turned around to lead me on my next disconcerting journey. As we passed Mikey’s room the ghost gave a nod his way and we kept going. We completed our journey in what seemed to be a classroom, not unlike the ones Mikey has been in over the past few years. “These children are of my Mikey’s generation. Sadly, with 1 in 50 children being diagnosed on the autism spectrum, it is more common for families to be touched by this disorder,” I acknowledged. “This is a crossroads!” the ghost’s voice shook my entire being and filled me with both fear and optimism. She rolled over and I could hear she was sleeping peacefully again. I waited for my next visitor until my eyes were too heavy to fight. These Ghosts of Autism are heartless bastards. Just as I felt the warmth of a restful sleep coming upon me, I was jolted upright by the sound of millions of children and a light that pulsed inches from my face. Opening my eyes in fear, there was yet another specter floating next to my bed. “I am the Ghost of…” he began. “Autism Future. I know, I know,” I groaned with surprising audacity for someone who was facing a ghost. “So, you have been anticipating my visit?” the ghost asked. “Haven’t we all?” I countered. I blinked and found myself in a classroom again. But this one, this one was huge. The biggest I’d ever seen. And it was jam-packed with obviously autistic children and very few teachers. Many of the children were unattended and entertained themselves with their variety of stims. “This is tragic! I don’t like this path. Please, please, take me to the second path,” I begged. 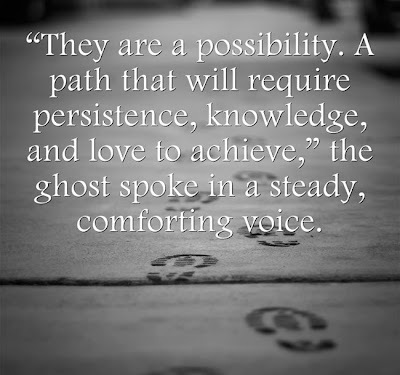 “They are a possibility. 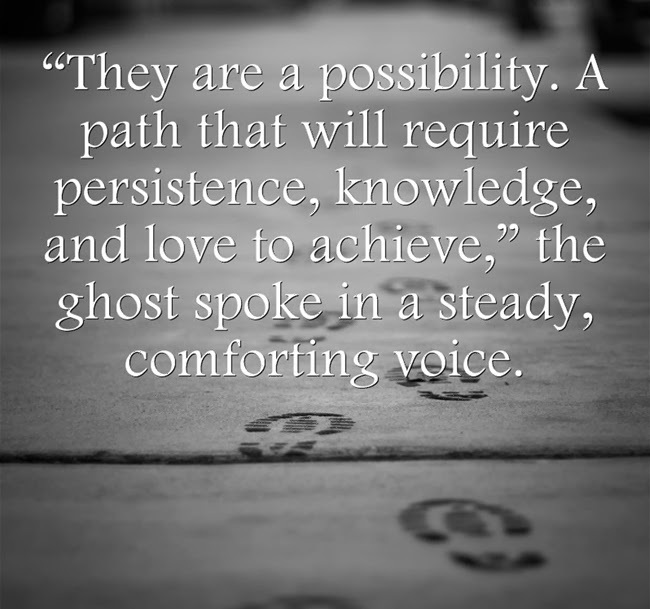 A path that will require persistence, knowledge, and love to achieve,” the ghost spoke in a steady, comforting voice. “I can do those things, but how, how do I get others to do them?” I wondered out loud. And with that, I once again found myself in my bed. But this time, I was smiling. I rolled over and kissed my wife on the back of the head. Got up and tip-toed into Mikey’s room again. The glow from his night light lit his face and I swore he was smiling, too. I returned to bed and as I closed my eyes I realized it was after midnight and now Christmas Day. I fell asleep and my dreams were filled with what would be the greatest gifts of all.